First off, there actually seems to be two types of guilt. The first one is actually not even guilt, but is remorse. I will give my definition and purpose of remorse and then the dictionary's definition. I see remorse as motivating sorrow for an act that we committed against the expectations we have (see above for expectations). Remorse is a positive motivator to change our behaviors that do not work or promote positive growth. Remorse is highly value laden as the individual can only feel remorse if they have broken a perceived value. Remorse does not involve shaming or demeaning oneself in any manner. Webster's online dictionary states remorse as: a gnawing distress arising from a sense of guilt for past wrongs. It's possible now as I read it that a definition of sorrow would be more appropriate for my interpretation of sorrow. However, for the time being I'll continue to use remorse. I find it interesting that the first definition involves the placing of a "penalty." 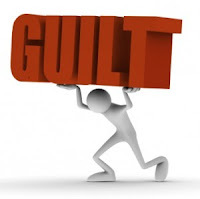 Guilt, as I see it, is placing a negative and overly harsh consequence on oneself. Being that it is demeaning and results in a greater "sense of inadequacy" it doesn not seem to foster self-actualization (Maslow's Heirarchy: see http://en.wikipedia.org/wiki/Maslow's_hierarchy_of_needs), self-worth building, or healing. In fact, it does the exact opposite. What I see in my job and personal life (friends and family) is a lot more of the second guilt than the first. It is hard to say why we all seem to fall into guilting ourselves, but my perception is that a majority of us do it. The second guilt is almost in competition with the first and mocks growth and development. They are opposites and compete for dominance. I'd say that the second is doing quite well, especially in the mental health industry. Why do we do the second more often? Each therapist, depending on their preferred model might have differing opinions. I will not attempt all of the models of thinking. I will just say this. We always do something for a reason. If we guilt ourselves for a reason and it is not working, replace the behavior with one that will. If you want to "peal the layers" to find out "why" you do what you do, go for it. The increased self-awareness will be helpful in figuring out what isn't working. Much of the reason, I believe, has to do with an individual's self-worth. If one does not feel much self-worth, then it is easier to be negative as it feels more real. Then, as this is the case, one must begin the process of change by just "doing" what will work. Not thinking about it. Just DO IT! If you normally put yourself down, do the opposite. Build yourself up! It really doesn't take much. All you have to do is start with simple silly things such as saying in the morning, "I like myself." If it is difficult to do it, then just do it anyway. Your mind will follow suit. Guilting oneself can become a habit. We do it for a payoff and a reason (negative). So, just change it. Change must be hard in order for it to stick and be worth it. I like the idea that guilt (or remorse) that is a motivation for action is good, but guilt that becomes a definer of ourselves is counter-productive. Good article! I'm good enough, I'm smart enough and dog-gone it, people like me.